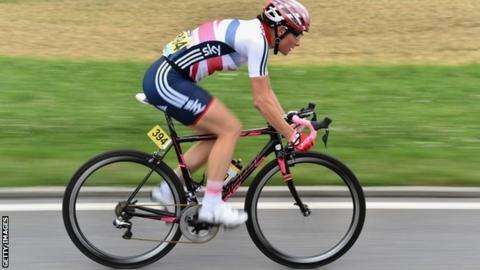 Dame Sarah Storey claimed the 17th title of her cycling career and her second at the 2015 Para-cycling Road World Championships by winning Saturday's road race. The 37-year-old followed Thursday's time-trial triumph with a comfortable victory after attacking on the first lap in Nottwil, Switzerland. Storey finished well clear of Poland's Anna Harkowska, who also finished second to Storey in the time trial. "I feel really good," said Storey. "The worlds before a Paralympic year, in any sport, are the hardest because everyone wants to take the psychological advantage into the Paralympic year. "Next year will be my third Paralympics as a cyclist, and you need to take those psychological scalps. The next 12 months people really begin to ramp it up so it's a really good indication of where you are and what you need to do." Storey is Britain's most decorated female Paralympian with 22 medals. She has won 11 gold, eight silver and three bronze medals in both cycling and swimming across six Paralympics. Storey won four golds at the 2012 Games in London and has now won 22 world titles across both sports. She began her sporting career in the pool, winning six medals at the 1992 Paralympics before switching to cycling in 2005. Storey won her first Paralympic gold medals in the 1992 games. She won six medals in total in the pool in Barcelona. She switched to cycling in 2005 and won gold on the track and the road in Beijing three years later. Elsewhere, Simon Price finished fourth in the C2 men's road race after a closely contested sprint finish. Hannah Dines (T2) and Megan Giglia (C3) also finished fourth - although neither was in medal contention. Lora Turnham and Corrine Hall - the defending world champions - came sixth in the women's tandem race. An early attack left Steve Bate and Adam Duggleby out of the running in the men's tandem event.